Exhibitors - Chicago - Facades+, Premier Conference on High-Performance Building Enclosures. Meet with industry-leading manufacturers of every possible exteriors product. 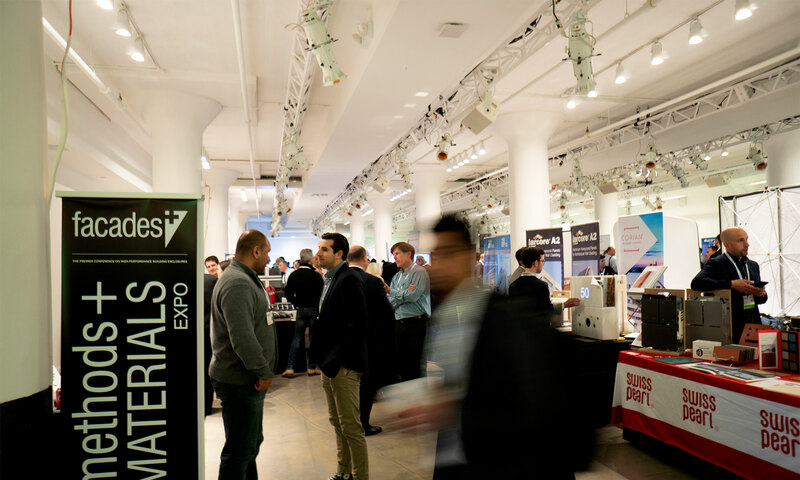 Over sixty companies from cladding, glazing, framing + facade systems, to advanced materials and service sectors will be on hand to field questions and demo products for all of your project needs. The Architect’s Newspaper serves up news and inside reports to a niche community of architects, designers, engineers, landscape architects, lighting designers, interior designers, academics, developers, contractors, and other parties interested in the built urban environment. The Architect’s Newspaper delivers quality news and cultural reporting through print, web, blog, newsletter, or Twitter—all the news you want, in all the ways you want to get it. If you care about architecture and design, join our community and get in the know. Vitro Architectural Glass (formerly PPG glass) is the largest glass producer in North America. Vitro Glass is primarily focused on commercial and residential construction markets and produces industry-leading glass brands such as Solarban® solar control low-e glass, Sungate® passive low-e glass and StarphireUltra-Clear™ glass. Learn more at www.vitroglazings.com. Driven by a desire to serve our customers, YKK AP America offers market-driven products backed by world-class technology and a dedication to be the very best at what we do. Consistent with the philosophies and principles of the global YKK Group, we combine engineering, innovative system designs, and vertically integrated manufacturing processes to provide fenestration systems at the highest level of quality and at a competitive price. Committed to protecting the environment and the communities in which we operate, the Dublin, Georgia manufacturing center has achieved ISO 14001 status recognizing our advanced environmental management systems for recycling and the conservation of natural resources. AGNORA fabricates the largest architectural glass in North America. We temper, laminate, insulate, heat-treat, machine and digitally-print oversized glass for a variety of cultural, high-end residential, and luxury retail projects. From Manhattan penthouses to Hollywood movie sets, airport control towers to woolly mammoths, our projects are unique, exciting, and always leave us in anticipation of the next big challenge. Since AGROB BUCHTAL began manufacturing ceramic tile in 1755, we’ve been a leader in next-generation architectural ceramics. In the 1930’s we introduced non-slip ceramics, today we offer hydrophilic, self-cleaning ceramics for interior and exterior applications. Architects worldwide appreciate our ceramic products, customization options, and comprehensive Architects’ Services. We’re a leading global paints and coatings company and a major producer of specialty chemicals. We bring color to walls. Help protect the buildings you go in every day. We’re in your mobile devices, the cars and roads that move you around and are an essential part of the products that keep you healthy We supply innovative and sustainable paints, coatings and specialty chemicals to customers around the world. As well as offering key functionalities, our products also play a vital role in the manufacturing process in many industries. An exclusive partnership of the leading precasters in North America dedicated to “innovation powered by collaboration”. Members work together to speed and perfect technologies that improve the build environment. Products and Technologies offered by AltusGroup members include CarbonCast® high performance sandwich walls and architectural cladding, ARCIS® ultra-thin prestressed concrete panel products, and Graphic Concrete imaging technology among others. Axalta’s architectural powder coatings are available in many colors and finishes that meet or exceed AAMA 2603, 2604, and 2605, and will keep you at the forefront of architectural color trends. Axalta’s Dura Coat division produces liquid coatings that meet or exceed AAMA specifications and provide flexibility to customize colors. Boston Valley Terra Cotta is recognized as an innovative manufacturer of architectural ceramics, producing architectural terra cotta, roof tile and the only U.S. manufactured rain screen system, TerraClad™. BVTC has collaborated on numerous R&D initiatives with visiting artists, scientists, and architects, participating in construction projects from design development to completion. Bronze Craft has over 20 years’ experience supplying motorized window actuator systems with advanced European technology. From simple open/close to advanced integration, our customers trust our Engineering team to support their projects. Bronze Craft also has a 75 year history supplying quality window hardware made in the USA. Cambridge Architectural began with an architect’s vision – an insight that perceived woven wire mesh as a unique and beautiful alternative to traditional designs. In 1958, Cambridge International produced a woven metal mesh to clad elevator interiors in the world-renowned Seagram Building in New York City. That first installation has lasted over 60 years, retaining its pristine look and condition.In the years that followed, a partnership formed between architects and Cambridge, which realized the possibilities for architectural mesh were endless. By working with architects all over the world and being open to new and adventurous designs, the Cambridge team began developing a new vision to integrate woven metal mesh into the built environment. CEI Materials is a Nation-Wide, full-service provider of Architectural Cladding Systems and Components. From concept to completion, new construction or retrofit, clients can rely on CEI to deliver the highest standard of quality. CEI works with Architects, General Contractors and Installers on all aspects of the project including Design Assist, Project Management, Fabrication and Installation. CENTRIA, the world’s leading provider of high-performance building envelopes, is committedto advancing building science, sustainability, and aesthetics through rigorous R&D, innovation,and world-class service and support to the building community. Corian® for exterior cladding brings personality to virtually any type of environment, enhancing and facilitating the lives of those who use and enjoy its unique potential. It can be crafted into almost any shape, for any place, for any purpose, and is available in a wide range of colors, offering you the freedom to design, explore, and create. Long-lasting, durable, and elegant, Corian® exterior cladding panels have a three-dimensional formability that has been liberating inventive and artistic minds for over 40 years. The Cosentino Group is a global, family-owned company that produces and distributes high value innovative surfaces for architecture and design. As a leading company, Cosentino imagines and anticipates together with its customers and partners design solutions that offer value and inspiration to people’ lives. This goal is made possible by pioneering brands that are leaders in their respective segments such as Silestone®, Dekton® and Sensa by Cosentino®. Technologically advanced surfaces, which allow the creation of unique designs for the home and public spaces. Eastman is a specialty chemical company that produces a broad range of products including Saflex® and Vanceva® laminated glass interlayers that enhances glass in terms of safety, security, strength, style, solar and sound control. Architects/engineers count on Eastman for expert technical support during the design phase. Guardian SunGuard Advanced Architectural Glass and Glass Analytics tools provide facade solutions that allow architects and designers to explore all the aesthetic and functional possibilities of building with light while meeting increasingly complex energy, daylighting, LEED and performance requirements. New SunGuard SNX 51/23 glass offers an industry-leading combination of high visible light and low solar heat gain. Hydro delivers customized aluminum extrusions for your own building systems as well as complete branded systems for the building envelope. Our Sapa, Technal and Wicona brands develop and manufacture complete systems, while our local manufacturing plants produce the architectural extrusions that fit your own systems. Since our founding in 1926, Indiana Limestone Company has continued to build upon its tradition of excellence and innovation. From our blocks and slabs, to residential and commercial building veneers and landscaping products, we are the leading fully integrated supplier of the Nation’s Building Stone. Island Exterior Fabricators is an all-inclusive façade subcontractor, functioning as a valuable resource for architects, owners, and general contractors alike! Our diverse team has the capability to provide building envelope consultation, design, engineering, and fabrication – as well as performance testing & final installation. Island utilizes modern digital fabrication methods to create precisely designed facade systems, which help us execute even the most unique and complex architectural visions. We pride ourselves on finding the technical solutions required to deliver high-performance facades, accommodating the ever-increasing demand for functional building enclosures. JE Berkowitz, LP is a leading architectural glass fabricator. Founded in 1920, the ISO 9001 certified company serves customers for the domestic and overseas architectural markets. Products include Tempered Glass, Insulating Glass, Spandrel Glass, Silk-Screen Glass, Glass Doors and Entrances, Laminated Glass and Point Supported Canopy and Wall Systems. Kawneer offers architectural aluminum building products and systems for the commercial construction industry. From thermal efficiency and sustainability to hurricane and blast resistance, we offer a dynamic range of innovative, high-performing products/systems for renovation and new construction. Kawneer’s comprehensive product portfolio includes entrances, framing systems, windows and curtain wall systems. McGrory Glass manufactures custom metallic and vibrant-colored glass for exterior applications, as well as a patented interior wall cladding systems. Additionally, we produce DecoShade – “one-way” vision glass. We are a strategic partner with Glas Trösch (Butzberg, Switzerland), and together we produce high-performance make-ups including Luxar® Anti-Reflective glass. Mermet has been a world-leading manufacturer of premium solar screen fabrics since 1976. With more than 40 years of experience mastering the engineering and design of sun control textiles, Mermet’s mission has always been to provide our customer’s with shading solutions that enhance solar protection, energy savings, durability, aesthetics, acoustical comfort and more. Neolith, a Sintered Compact Surface, is a revolutionary new product category pioneered by TheSize to effectively respond to the most demanding architectural and interior design needs. Designed and produced in Spain, Neolith is a 100% natural product with extraordinary technical characteristics that make it an ideal material for exterior and interior applications. Northern Facades Ltd is a leading fabricator for architectural metal panel and unitized glazing systems. Our expertise consists of Design Assist, Engineering, Custom Systems Design, Drafting, Manufacturing, Testing, Value Engineering, and Project Management. We work with the building envelope community to deliver designed, code compliant fabricated systems to building owners enjoying beautiful facades lasting for many generations. W&W Glass is one of New York’s largest architectural glass and metal subcontractors, specializing in unitized curtain walls, storefronts, and interior glass and glazing. W&W is the North American distributor of the Pilkington PlanarTM structural glass system. Pilkington is renowned worldwide for its high-quality glass fabrication and fully tested warrantied systems. Today, ventilated facades are considered to be the most advanced, effective and safest means of installing ceramic tiles on facades, providing buildings with aesthetic, technical and environmental benefits. Porcelanosa offers technical assistance throughout your entire project, from the design stage through to construction. We offer a multidisciplinary team comprising architects, engineers, CAD experts and tile specialists. For over 50 years, PPG has pushed the limits of what’s possible in architectural metal coatings. What started with the revolutionary DURANAR® coatings in 1967 has grown to include advances like infrared-reflective pigments and customizable powder coatings, innovations that are more versatile, architect-friendly and environmentally compatible than ever before. The ROCKWOOL Group is the world’s leading manufacturer of stone wool insulation. We offer a full range of high-performing and sustainable insulation products for the construction industry. Our insulation products are based on innovative stone wool technology and today we are the world’s leading manufacturer of stone wool insulation. The ROCKWOOL group also includes a range of sister companies delivering specialist solutions for the horticultural, marine and offshore sectors. SFS Nvelope rainscreen cladding support systems are develop to support the most demanding cladding materials. Adjustable brackets and rails available in vertical or horizontal systems for exposed or concealed fastened applications are cost effective, easy to install or adjust and accommodate a wide range of cavity depths. Nvelope systems meet structural and thermal demands of today’s building requirements. Spectrum Metal Finishing, Inc., is a custom applicator of liquid and powder coatings servicing the commercial construction markets throughout the US. A member of PPG’s elite “Certified Applicator Program” and ISO-9001 Certified. Licensed by all major Kynar 500 paint suppliers. We meet/exceed all AAMA 2603, 2604, and 2605 specs with capabilities up to 33’ with 20 year warranties. Specified Technologies Inc. (STI) is a leading manufacturer of innovative firestop solutions designed to stop the spread of fire, smoke and toxic fumes. With over 1,300 UL® Classified systems, STI specializes in cutting edge perimeter fire containment systems including backpan designs, flush and reduced sill heights, and connection protection. Sto is an international technology leader in the design and production of innovative building materials tailored to human needs. Our wall systems, coatings and finishes have been the choice of leading architects, engineers and contractors for 61 years, and we are the world’s largest manufacturer of exterior thermal insulation systems, with 35 subsidiaries, more than 5000 employees, and 21 factories operating around the globe. SWISSPEARL is the leading European manufacturer of cement composite façades for quality, high-end architecture. As the world leader in coloration technology and facade knowledge, our cement panels offer a wide range of products, aspects and colors specially designed to meet architects’ needs for superior rainscreen cladding applications. Tecnoglass is a fully integrated group of companies including Tecnoglass SA, ESWindows and Alutions, which offer the latest technology on glass, aluminum frames, facades and window systems. These companies employ over 5000 people and sell to 27 countries, providing single source responsibility in all their products. As a global company with more than 120 years of expertise, UL works with customers and stakeholders to help them navigate market complexity. UL brings clarity and empowers trust to support the responsible design, production, marketing and purchase of the goods, solutions, and innovations of today and tomorrow. We connect people to safer, more secure, more sustainable products, services, experiences and environments – enabling smarter choices and better lives. Valspar has been a leader in the art and science of coatings for over 200 years. Our factory applied Fluropon 70% PVDF metal coatings have a full palette of field-proven, high-performance, architectural finishes that will help you achieve any design while meeting the industry’s toughest standards, including AAMA 2605. Viracon offers a complete range of architectural exterior glass products. We not only fabricate glass, we also deliver design, aesthetic, budget and performance solutions for projects big and small. Our offering includes insulating, laminated, silk-screened, digital print, spandrel, hurricane-resistant, acoustical, blast-mitigating, electronic eavesdropping mitigating and a broad selection of proprietary high performance coatings.